Knoco stories: Too much collaboration? Collaboration is one of those words that is often taken as being overwhelmingly positive, and something everyone should do. But is it? With the exception of France, where a "collaborateur" is still a dirty word, the concept of collaboration is usually seen as a very good thing. When people cooperate and collaborate across borders and organisational divisions, we expect good things to happen. But as with most generalisations, this is only partially correct. I have already reported how Haas and Hansen, in a study of a large services firm, identified cases where collaboration helps, and other cases where collaboration hinders success. 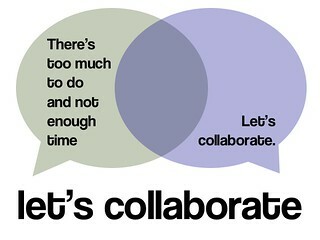 Not all collaboration is good - some of it is a waste of time or creator of unneeded confusion. And now here is an interesting article by Rob Cross, Reb Rebele and Adam Grant on collaborative overload, which points out that requests for collaboration are seldom evenly distributed, and often the collaborative load falls on relatively few employees. They say, for example, that up to a third of value-added collaborations come from only 3% to 5% of employees, and that these employees often feel overloaded, disengaged and disaffected as a result, and can become bottlenecks rather than enablers. Cross et al suggest ways in which this issue can be addressed; once the overloaded collaborators are identified, you can either give them ways to filter out, or shut off, requests for help, you can use redesigned office space and/or collaboration tools to make collaboration less of a burden, you can spread the load, and you can look for ways to reward collaboration. There is another way as well. then give specific collaboration roles to this 3%. Roles such as Community of Practice Leader, CoP Facilitator, Knowledge Owner, Knowledge Manager, Knowledge Librarian - all of these can be excellent roles for the ace collaborators, which will fit and recognise their own drive to collaborate, make them happier and more fulfilled, and add value to the organisation as part of a Knowledge Management Framework. We should not assume that collaboration is always over and above your dayjob - collaboration can *be* the dayjob.